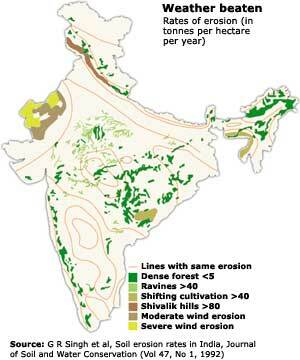 India faces an acute problem of soil erosion. On an average, the country is losing soil at a rate of 16 tonnes per hectare (ha) annually, which is more than three times the acceptable limit of 4-5 tonnes. Even the Union agriculture minister, Sharad Pawar, had raised concern over the problem at the first Krishi Vigyan Kendra Conference, held in Delhi recently. Soil erosion is the loss of topsoil, for which rain is the biggest cause. Water is about 800 times heavier than air and about as heavy as loose topsoil. A drop of rain hits the ground hard enough to dislodge the soil, which is then carried away by flowing water. In India, wind is the major agent of erosion only in the Thar desert. Other factors influencing erosion include soil structure, vegetation cover, slope, land and water use patterns. In a study published in the Journal of Soil and Water Conservation (Vol 47, No 1, 1992), Gurmel Singh and colleagues from the Central Soil and Water Conservation Research and Training Institute, Dehradun, classified soil erosion into six categories -- from slight in dense forest areas and arid regions (where wind erosion is prevalent) to very severe in the Shivalik, the outermost range of the Himalaya (see map). Though some parts of Shivalik are thickly forested, the average erosion rate there is more than 80 tonnes per ha per year. A major reason behind this is the seismic activity in the Himalaya, which loosens the soil. Besides, the soil structure is poor owing to a geological factor -- the region once constituted the bottom of the Tethys Sea (in an earlier era). Lastly, the steeper the land, the faster the water running through it, and greater the erosion. In Hoshiarpur district of Punjab, along the foothills of Shivalik, the erosion rate is as high as 400 tonnes per ha annually. Besides Shivalik, a large part of Peninsular India, including the Western Ghats and the black cotton soil regions, and coastal zones are the most vulnerable. In Maharashtra, over 70 per cent of the cultivated land has been affected by erosion, of which about a third is no longer cultivable. In these regions, inappropriate agricultural activities have added to the problem. For instance, in rain-fed areas, usually only a single crop is grown, leaving the land unused for almost eight months a year. This reduces moisture and organic content of the soil, leading to erosion. Soil erosion is a gradual process that is balanced by soil replenishment, occurring as a result of weathering of rocks. However, deforestation and improper land and water management have aggravated the problem. Most of the agricultural land faces the problem. Excessive irrigation, water-logging and defective drainage also increase erosion (by loosening the topsoil). Road construction is a significant cause in the hills. According to an estimate for the Himalaya, construction of one kilometre of road creates 40,000-80,000 cubic metres of debris. Soil erosion reduces agricultural productivity through the loss of nutrients and topsoil. Excessive use of fertilisers has become common to compensate for the loss of nutrients. This has given rise to another problem. Excess fertilisers are carried by streams and rivers ultimately to the sea, where they lead to eutrophication. High erosion rates have also made rivers flood-prone and reduced storage capacity of dams due to siltation. It is estimated that almost half of the country's total landmass needs conservation measures to check soil erosion. Satellite imagery now enables both the monitoring and measuring of soil erosion. Whether we need mechanical solutions (such as check-dams to reduce speed of flowing water, and increase groundwater recharge) or ecological measures (planting trees, shrubs and grasses) for soil conservation is still debatable. But if such measures are not taken, the country will have to resort to artificially treating the soil to reclaim it, as is happening in some countries like the Netherlands. Left unattended, the problem could adversely affect agriculture, the sector that is by far the major source of livelihood in India.